Welcome to Le Jardin Hayes, We are a local florist in Kilburn Square Market on Kilburn high road. We provide a personal and excellent customer service and can offer same day delivery if ordered before 2 pm UK local time and will hand deliver to your chosen recipient. We also specialise in flowers for business and can arrange flowers for any Special Event or Occasion. 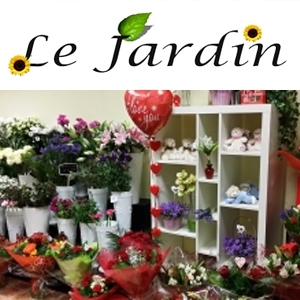 Le Jardin – stunning flowers at great prices! We are a family run business which believes in providing an excellent customer service. Whether you need flowers for weddings, birthdays, funerals, anniversaries – you can always be assured of a friendly and personalised service. We also specialise in corporate flowers for offices and hotels. See the amazing selection on our website of gorgeous bouquets, stylish floral arrangements and baskets. We offer same day delivery. Drop by at our stall for a warm welcome or order online. We deliver to the areas of St Johns Wood, Kilburn, Hampstead, Wembley, Cricklewood, Harlesden, Maida Vale, Harrow, Golders Green, Harlesden, Camden, Westbourne Grove and Swiss Cottage. My friends loved their arrangement. <br/> <br/>Perfect for a couple just married. My daughter was thrilled to get her flowers. The flowers looked better than the photo I&rsquo;d picked from on the Internet. They were exactly what I wanted! Thank you so much, my mum was overjoyed with her flowers, said they were so fresh and the roses had the most beautiful scent. Will definitely get my flowers from here again. Great service and a beautiful display. Ordered flowers for a colleagues birthday. Arrived right on time and were beautifully presented. Also a very generous selection of flowers. Well done, I&rsquo;ll be back. 6 Red roses in beautiful gift bag.